As an attempt to save money I have been cooking at home. Our family went from eating out three to five times per week, down to once or twice per month (the pizza places are bummed out). Although it is less convenient, it saves a huge amount of money (Well, duh Sara... ) and I am home all the time now so it doesn't bother me to cook everyday. One of my goals is to be able to get my meal cost around eight dollars (for four people). Its going well so far. 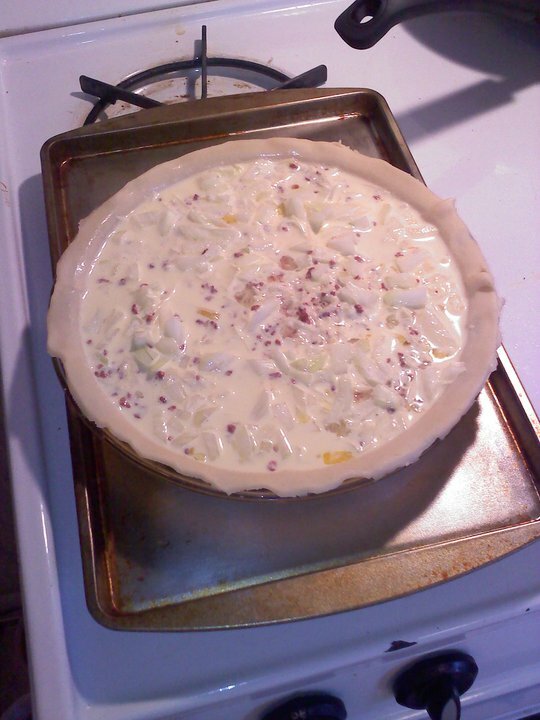 In a medium bowl, mix the bacon, onions and both cheeses. Place mixture in the pie crust. Mix the eggs and half & half in a bowl. Pour the egg mixture over the cheese mixture. Bake in preheated oven for 15 minutes. Reduce heat to 350° F (175° C) and bake for and additional 35 minutes, until top of quiche is turning brown. Make sure not to disturb the quiche while it is baking. I literally tip toed around my home while it was cooking. If you have to open your oven to see if it is turning brown, make sure to close the door gently. Let it stand for about five minutes before serving. It kind of reminds me of an Egg Bake recipe I have. There were air bubbles popping up as I took this photo, so expect that. 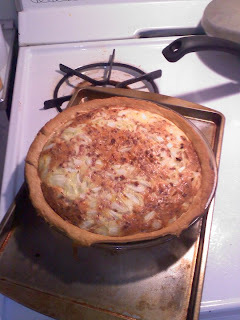 The smell in the air while it was cooking reminded me of an Onion Tart, maybe I will try that next! I actually forgot to add the onions in the cheese mixture and ended up tossing them on top (before I poured the egg on). That is why you see so many onions. I was super excited that it did not deflate! Overall, it was fantastic! Cully (my other half) ate a good portion and finished the rest off for breakfast the next morning. I enjoyed mine with Ketchup (of course!) and he put Sour Cream on his. I was nervous thinking the Swiss would be overpowering, but it was quite good. Would I make it again? Yes! Total overall cost for this dish about $9.00. I can't even feed two of us at McDonald's for that! I think next time I will have to delve a little in to my grocery shopping process but its time to get something done around here, so until then!